Daddy, Can I Have a Harley? I bet Lucas never thought he was going to have to see the day when Ke’alohi wanted to buy a Harley Davidson. 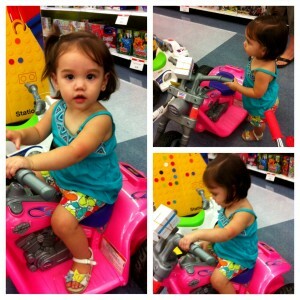 We were walking around Toys ‘R’ Us (big mistake) when Ke’alohi saw it, a pink motorized Harley Davidson. She was completely obsessed with it and didn’t want to get off once she was playing on it. Hopefully she will forget about it and not ask Santa for it for Christmas. Hahaha. Harley-Davidson’s?!?! Are there really any other motorcycles out there that really counts? No, there isn’t…..vroom vroom!!! Pretty! This was an incredibly wonderful article. Thank you for suplying this information. Awesome! Its truly remarkable piece of writing, I have got much clear idea on the topic of from this post. made perfect content material as you did, the web may be a lot more useful than ever before. this. You must proceed your writing. I am sure, you’ve an enormous readers’ base already!